So what is the anticheat situation? Server scripts? Streaming? It's far less interactive than it used to be. No need to stream, no need to mess with scripts, no need to request background checks, no need to do anything. The only reason to bring something to our attention is team killing or other in-game abuse. How about the aim hacks and such? If I want to run anti-cheat scripts, since I would own the server, I assume I could do that. You probably could, no reason to. I highly doubt you'll find anything better than the stuff already included in Assist. Seriously, don't worry about it. The question is how are the Assist scripts protecting each server. I am very familiar with the AA anti-cheat due to previously being heavily involved in AA anti-cheat. 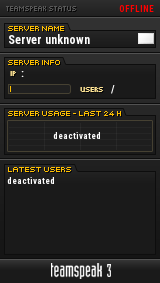 Assist actually looks at every person on it's own, not the server so much. Probably (can't be 100% sure of course) all old and commercially available cheats are detected automatically. Others leave other kind of violations that help us steer to the right direction and find the cheats. ELiz did not correct you . . . . LOL. The scripts are run on each server but they check each player. As for how or what they do, that information is not made public normally so people do not know what they have too circumvent. You just need to know that they work. what was your name there august? Was mentor at AON back in the day. Worked with Kage, Yapple, Airdale and a bunch of the other guys. It's 2 bad aon. Shut down always did a great job. Still talk with yapple? @ airdale?? ?